Difference Between ADS-B Out and ADS-B In? 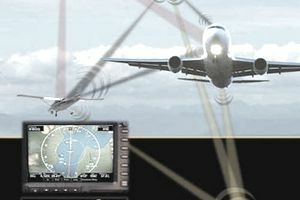 Automated dependent surveillance-broadcast equipment (ADS-B) equipment allows air traffic controllers and other participating aircraft to receive extremely accurate information about an aircraft's location and flight path, which, in turn, allows for safer operations, reduced separation standards between aircraft, more direct flight routes, and cost savings for operators. The system (ADS-B) is the foundation of the FAA's Next General Air Transportation System (NextGen). It's a satellite-based system that was implemented as an improvement over radar to make the nation's airspace more efficient. Two types of ADS-B can be installed on an airplane: ADS-B Out and ADS-B In. Both are valuable, but only ADS-B Out is mandated by the FAA, which established in 2010 that all aircraft operating in designated airspace must be equipped with ADS-B Out by January 1, 2020. Note that only ADS-B Out is required in your airplane, but it's important to understand how ADS-B Out and ADS-B In work together. ADS-B Out is the broadcast part of ADS-B. An aircraft equipped with ADS-B Out capability will continuously transmit aircraft data such as airspeed, altitude, and location to ADS-B ground stations. The minimum equipment needed for ADS-B Out capability includes an ADS-B-approved transmitter—either a 1090 MHz Mode S transponder or a dedicated 978 MHz UAT for use with a previously installed Mode C or Mode S transponder—and a WAAS-enabled GPS system. ADS-B In is the receiver part of the system. ADS-B In equipment allows aircraft, when equipped properly, to receive and interpret other participating aircraft's ADS-B Out data on a computer screen or an Electronic Flight Bag in the cockpit. The ADS-B In function requires an approved ADS-B Out system, along with a dedicated ADS-B receiver that has "in" capability. Additionally, an ADS-B compatible display interface will be needed for graphic weather and traffic displays (called TIS-B and FIS-B). TIS-B is short for Traffic Information Service-Broadcast. TIS-B services will work with both the 1090 MHz Mode S transponder and the 978 MHz UAT systems. No subscription service or added fees are associated with TIS-B. FIS-B, short for Flight Information Services-Broadcast, can be received only through the 978 MHz UAT structure. It's also free to anyone with a 978 UAT. A 1090 MHz Mode S transponder is required for aircraft flying at 18,000 feet and higher and is the standard in Europe. A 978 MHz UAT is primarily marketed to general aviation pilots, as it can only be used below 18,000 feet and in the United States. It is expected that aircraft owners will spend at least $5,000 to equip their aircraft with ADS-B Out, but costs are likely to be much higher than that. All aircraft that will fly into designated controlled airspace after Jan. 1, 2020 will be required to have at least ADS-B Out capability. At this time, ADS-B In is still optional but is a helpful tool for situational awareness. Many industry experts have called for an extension to the deadline, as well as exceptions to the rule, to have time to equip their aircraft. Maintenance facilities expect a backlog of ADS-B-related work, and many experts say there's very little chance that all of the required aircraft will be able to become ADS-B equipped before the 2020 deadline.